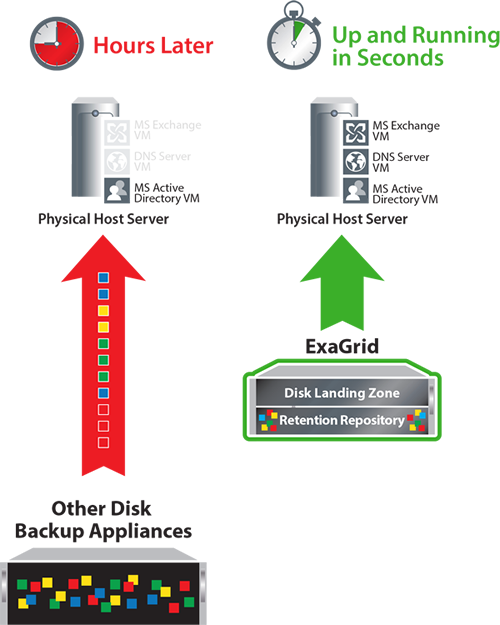 The ExaGrid system is a disk backup appliance that enables faster, more reliable backups & restores. Since backups write directly into the landing zone, the most recent backups are in their full undeduplicated form ready for any request. Local restores, instant VM recoveries, audit copies, tape copies, and all other requests do not require rehydration and are as fast disk. As an example, instant VM recoveries occur in seconds to minutes versus hours for the inline deduplication approach. 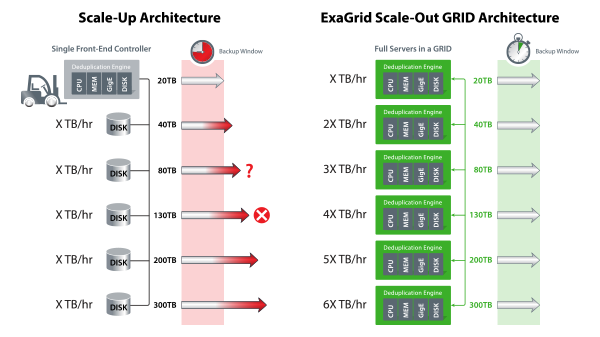 ExaGrid provides full appliances (processor, memory, bandwidth, and disk) in a scale-out GRID. As data grows, all resources are added including additional landing zone, additional bandwidth, processor, and memory as well as disk capacity. The backup window stays fixed in length regardless of data growth, which eliminates expensive forklift upgrades. Unlike the inline, scale-up approach where you need to guess at which sized front-end controller is required, the ExaGrid approach allows you to simply pay as you grow by adding the appropriate sized appliances as your data grows. ExaGrid has 10 appliance models and any size appliance or any age appliance can be mixed and matched in a single GRID, which allows for IT departments to buy compute and capacity as they need it. This approach also eliminates product obsolescence.